I have a love affair with PB2 happening right now, have you tried it yet? For those that don’t know, it’s a powdered peanut butter that has a lot of the fat and calories removed. For a peanut butter addict like myself it’s pretty much one of the best things ever. I’ve been trying all sorts of recipes with it lately and these 4 ingredient no bake chocolate peanut butter bars are my latest creation. 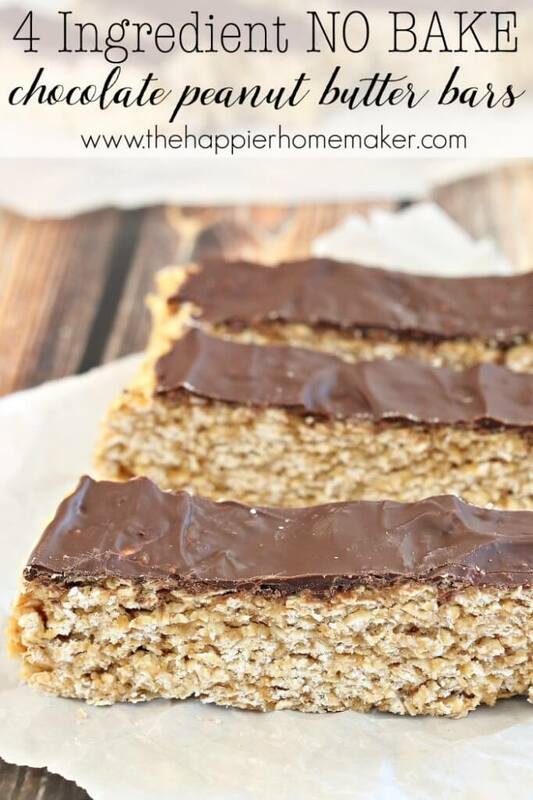 The combination of peanut butter, oats and honey is perfection and there’s just enough dark chocolate added to make it feel indulgent. Plus, coming in under 200 calories a serving, you might even be able to convince yourself they’re healthy! Mix water and PB2 until smooth in a small saucepan. Add honey and heat over medium low heat stirring constantly until blended, about 3 minutes. 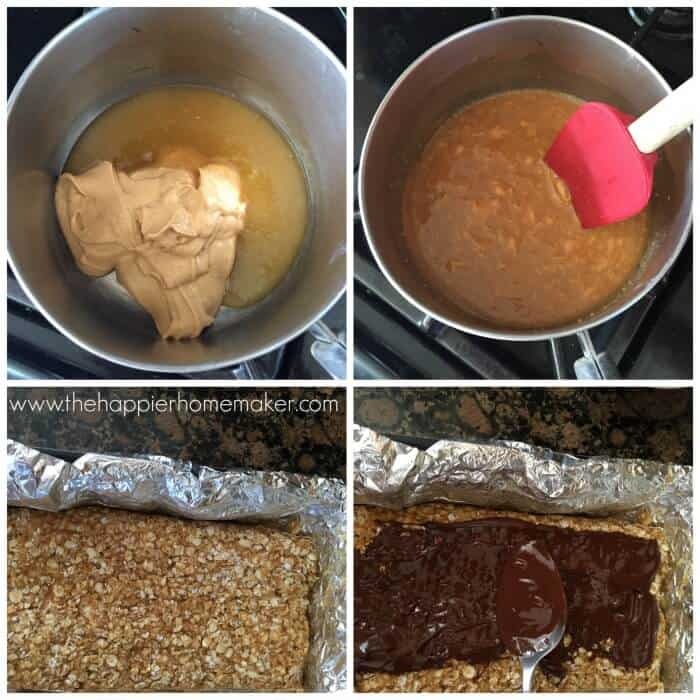 Pour oats in pan and mix until coated. Prepare an 8 by 8 inch pan with aluminum foil. Press oat mixture into pan, packing firmly. Microwave chocolate in a small bowl for 1 minute or until melted. Smooth chocolate over oat mixture with the back of a spoon. Freeze for one hour to set. Refrigerate until ready to eat. In a small saucepan mix PB2 and water until smooth. Add honey to saucepan and heat on medium low heat, stirring constantly until combined, about 3 minutes. Line an 8 by 8 inch pan with foil. Press oat mixture into pan. Microwave chocolate morsels for 1 minute or until melted. 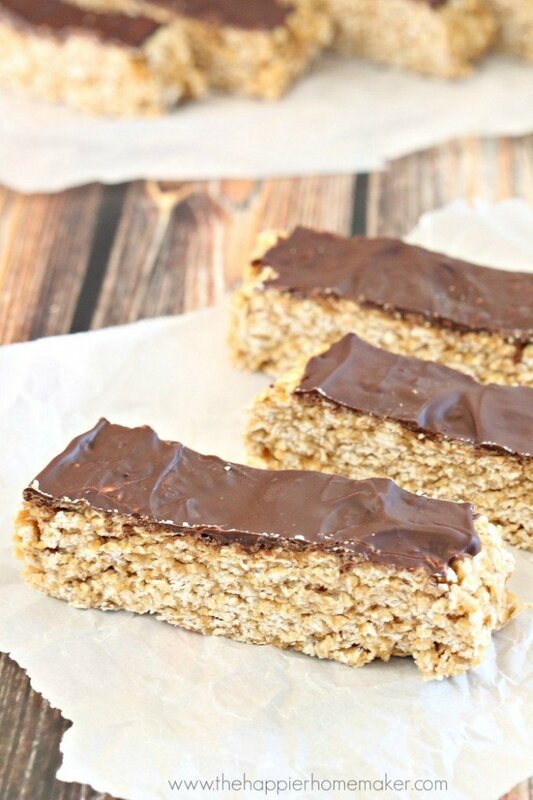 Use a spoon to spread chocolate over oats. Place in freezer for one hour or until set. Cut into 12 bars. Refrigerate until ready to eat. Can’t wait to try these! They look so good and chocolate and peanut butter is my favorite combination!